Water leaks aren’t a home safety issue, like a fire or an accumulation of carbon monoxide, but they can cause tremendous damage to your home that’s very costly to repair. To avoid the problem, you could deploy an inexpensive Wi-Fi-connected leak sensor like the Honeywell Lyric Water Leak and Freeze Detector, or you can make a bigger investment in a smart water valve that analyzes your water flow and automatically shuts the water off if something goes awry. The Flo by Moen is a great example of the latter. Sinopé’s Sedna water-leak detection system takes a third approach. Sedna combines leak sensors that communicate with a electronic water valve on your main water supply (there are 0.75- and 1-inch models available), so that if water appears somewhere it shouldn’t be—pooled around your washing machine or water heater, for instance—the valve will turn your water off to prevent a small leak from turning into a disaster. The Sedna kit (I evaluated the 0.75-inch Sinopé model number VA4200WZ-K5) includes the valve and five leak sensors, two of which have extension probes that extend their reach. The components are also sold separately, but the kit is aimed at homeowners looking for an easy-to-install solution. A mobile app—available for Android and iOS—ties everything together. That said, some people might prefer to hire a plumber to install the valve element of the kit, because it requires you to cut your main water line and—if you have copper pipes—solder new threaded fittings onto the line. I didn’t find this to be a particularly difficult DIY project, but it shouldn’t be terribly expensive to hire a pro for the job, either. It all depends on what you’re comfortable with. The electronic module mounts to a ball valve that you install in line with your main water supply. Unlike the Flo by Moen smart valve (and the Phyn Plus smart valve that we’re in the process of reviewing), the Sedna valve can only be installed indoors. You’ll also need to have an electrical outlet nearby to power the valve. Unlike those solutions, however, the Sedna can operate on four AAA batteries in the event of a power failure. A serendipitous wind storm caused a multi-day power outage while I was evaluating the kit, and I soon discovered that the battery backup doesn’t last long—two to three days at the most. 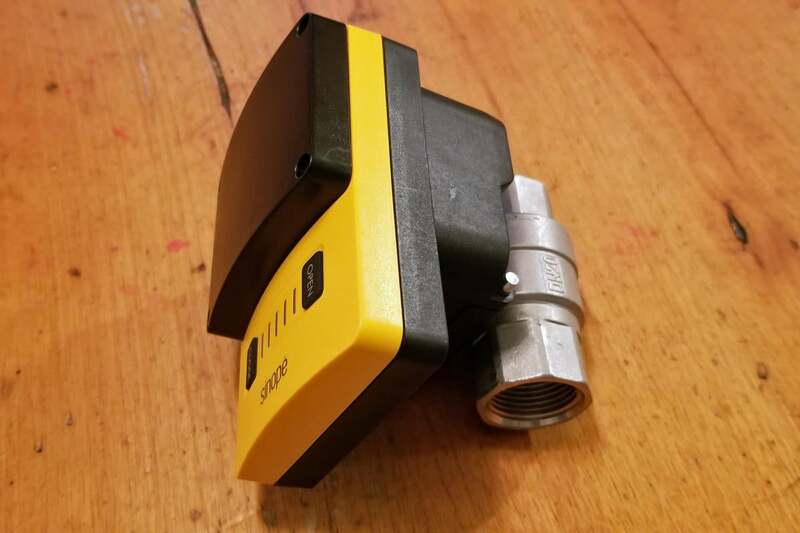 The Sedna valve uses a ZigBee radio to communicate with its leak sensors, and it has an onboard bridge to connect to your Wi-Fi network (2.4GHz networks only). The remote sensors should significantly reduce the number false alarms that cause the valve to shut off your water supply in error. The Flo by Moen and the Phyn Plus smart valves monitor flow rate and water pressure to detect leaks. And in our experience, anything from watering the landscaping outside of an established schedule to washing a car can fool them into thinking there’s an uncontrolled water leak that must be dealt with immediately. On the other hand, if a water line breaks far away from a Sedna sensor, it could be hours or days before the water reaches one of them and triggers the Sedna valve to turn off. As with the Flo and Phyn Plus smart valves, Sinopé’s valve constantly measures the water temperature (as do the remote sensors) and can warn you of freezing conditions that might cause a pipe to burst. But since the system can’t measure water pressure or flow rate (Sinopé says its working on a new model in the Sedna line that will), it can’t deliver insights on your water consumption or if there are other plumbing problems—a bad flapper on your toilet, for instance, or a leaky faucet or exterior hose bib—wasting water and costing you money. 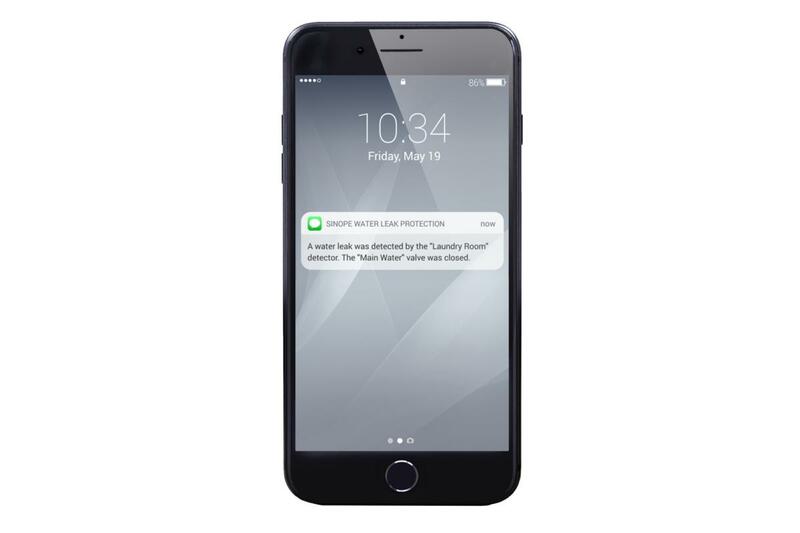 The Sinopé water-leak protection system can shut off your water supply and send you a text message if its sensors detect a leak. Each Sedna sensor measures 2.5 inches square and 0.75 inches high. You can plug 4-foot extension cables into two of them for deployment in hard-to-reach locations, such as underneath a dishwasher. Both types are incredibly sensitive and can detect as little as 0.015 inches of water as well as freezing temperatures. 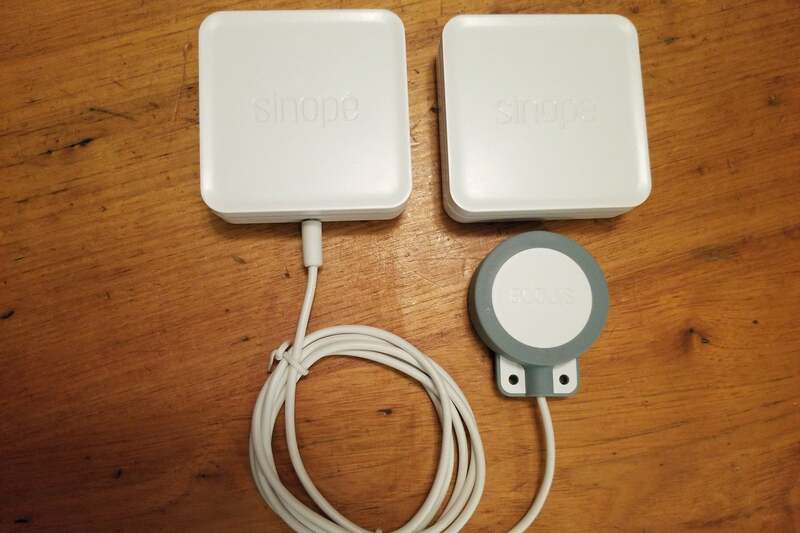 The sensors are powered by two AAA batteries, which Sinopé says should last up to four years, and the app reports the life remaining for each of them. Each sensor can be independently programmed so that some will trigger the valve to close if water is detected, while others will simply send you an alert to the app and/or a text message and leave the action up to you. The sensors also beep locally when leaks are detected, in case you’re around but don’t have your smartphone with you. The kit comes with two sensors units with extension cables (left) and two sensors without the extensions. 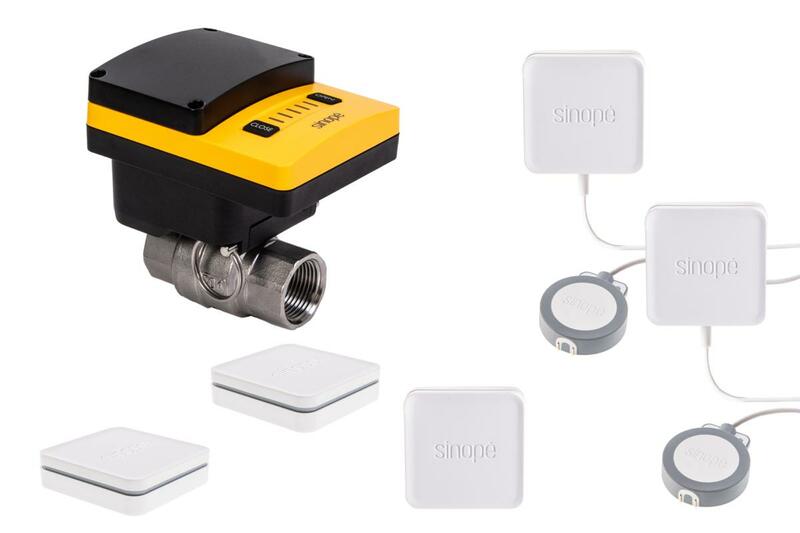 The Sinopé Sedna water leak protection kit isn’t cheap, but it is street-priced about $150 less than the $500 Flo by Moen smart valve, and it’s less than half the price of the $850 Phyn Plus. While its inability to measure flow rate and water pressure makes it less smart than either of those devices, its network of sensors renders it more foolproof—to a degree. If a leak occurs in your plumbing somewhere other than where you’ve placed a sensor, you could experience an awful lot of water damage before the system alerts you to the problem and shuts your water supply off. The battery backup is a great feature, although you could plug the Flo or Phyn into an uninterruptible power supply (if you can find an inexpensive weatherized model, that is). But Sinopé’s requirement for the Sedna to be installed indoors will be a significant problem if your main incoming water supply is accessible only from the outside. Leak detection and prevention will save you a lot of money, but you’ll need to weigh the pros and cons of the Sinopé Sedna against your home’s infrastructure to determine if it’s the right system for your needs. The lower price tag is attractive, but there are pluses and minuses to using discrete sensors versus a true smart valve to protect your home from water damage. System can’t detect water wasted by leaky faucets, toilets, etc.